This article is helpful to those studying for their CII AF1, AF3, AF5, R04, R06 and R08 exams. 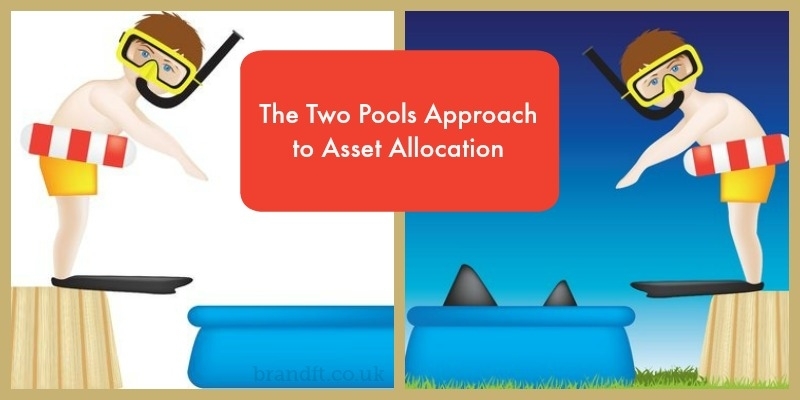 It outlines the two pools approach in asset allocation and briefly discusses the advantage to using this approach. The two pools approach to asset allocation comes up occasionally in the CII exams and is basically a different way of designing a portfolio and its asset allocation in retirement. In basic terms, the client’s assets are divided into two main pools; the first pool is a very safe pool and is made up of short to medium-term investments designed to carry the client until the riskier assets recover from any market turbulence. The second pool is made up of those riskier assets, which should have a much longer time horizon; equities to provide long-term capital growth designed to replace the assets in the safe pool when they dry up. It’s important to point out that there could be more than two pools; the number really is dependent on the client circumstances. The first pool is generally made up of cash, National Savings, gilts or even an immediate annuity – anything that is deemed stable. All this pool is doing is providing income for a specified period of time and avoiding stock market volatility. The second pool (or more) are made up of other assets with progressively longer time horizons, but generally will be made up of equities, property and possibly alternative investments such as commodities. The main advantage is that the client prevents potential portfolio disaster by avoiding stock market volatility whilst providing them with a stable retirement income as well as potential capital growth. There are of course risks attached to the safe pool; inflation risk for one – what other kinds of risk do you think might need consideration? If you’re studying for your CII R04 exam, and you’re worried about how you’ll do on exam day, grab our free taster to try out one of Brand Financial Training’s resources for yourself. Click the link to download the R04 mock paper taster now! Alternatively, you can download taster resources for AF1, AF3, AF5, R06 or R08 if one of those exams is giving you frown lines.